Each group of m-digit endings repeats in a cycle. Each cycle is a power of two in length, and for m ≥ 2, equals 2m-2. Ending digits are labeled with specific powers of five: those that make up the first occurrence of each cycle. 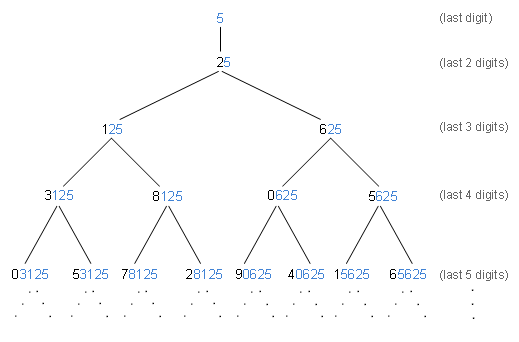 Each cycle — from the 3-digit endings on — contains the ending digits of 5m through 5(m+2m-2-1). Each pair of m digit endings has a common m-1 digit suffix. The starting digits of each pair of m digit endings differ by five. Why is there always a pair of siblings, and why do siblings match up as they do? The answer lies in the nesting of power of two sized cycles of ending digits. For example, the last four digits repeat in a cycle of four, and the last five digits repeat in a cycle of eight. To form the eight unique five digit endings, the set of four digit endings must be repeated; duplicate four digit endings will have different starting digits prefixed. Endings with the same suffix are a half cycle length apart, and are paired as siblings. 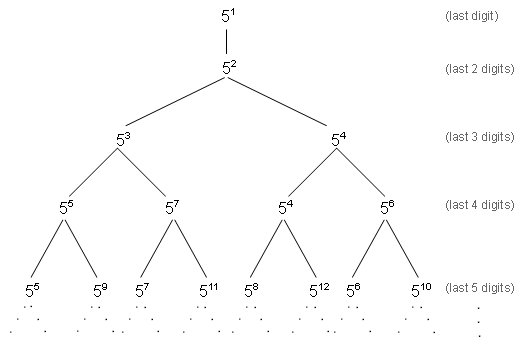 For example, in the length eight cycle of five ending digits, the following endings are paired: 1st and 5th; 2nd and 6th; 3rd and 7th; 4th and 8th. This expression has a factor of 24. I’ve shown that 52n – 1 has exactly n+2 factors of 2; that is, a factor of 2n+2. This expression has a factor of 55·24 = 5·104 = 50000. This expression ends in 50000. For i > 0, 5i ends in the digit 5; for i = 0, 5i = 1. In either case, multiplying by 5i leaves the 5 in the fifth digit unchanged.